They say details make all the difference, and it’s so true! Table settings are one of the things that are most often overlooked in a design, but a neat table setup is a great way to express style and achieve a cohesive look throughout a room. No matter if it’s for entertaining or for everyday use! 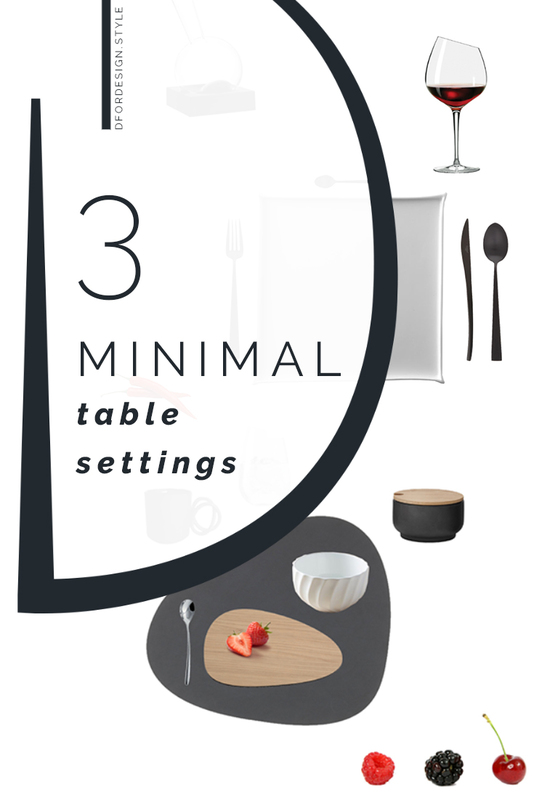 So here are 3 table setup proposals – always in a clean minimalist style – for whatever time of day or night you’re setting your table. Breakfast is a treat and this morning table setting is all about softness. 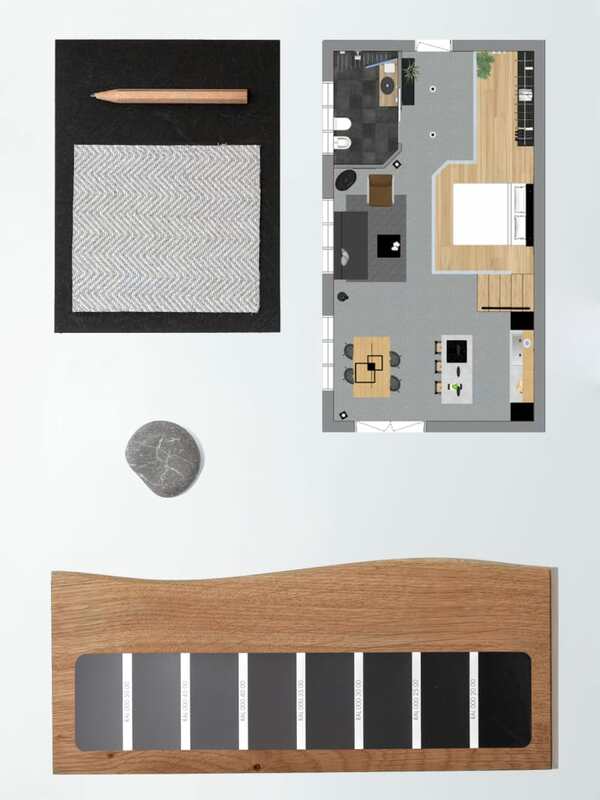 Curvy lines and mat textures are the perfect minimalist-style way to start the day. They’re somehow cuddling in the way they reflect light and with their gentleness they may even make it a little less traumatic to get up early! Few touches of wood warm up this dark-coloured table setting and all the attention is on the colourful food that will go on the table! 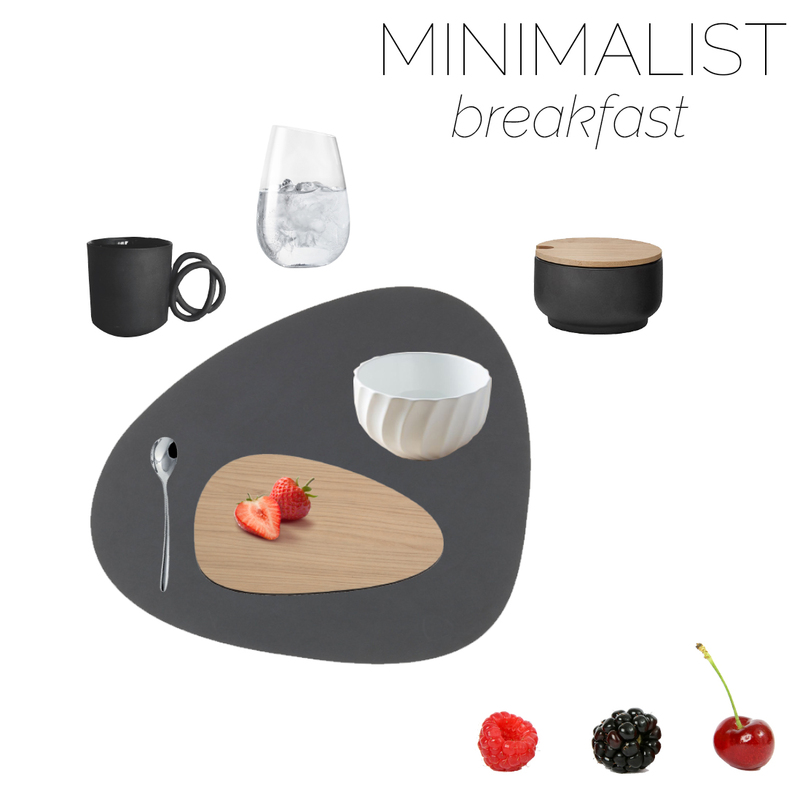 Credit: Lind Dna (via Amara),Alessi (via Amazon),Anthropologie,Ende Ceramics,Eva Solo,Stelton (via Finnish Design Shop). Mood board: DforDesign. 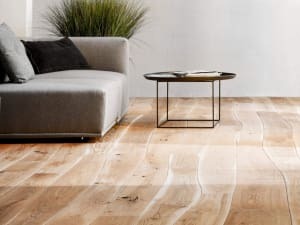 Curve Table Mat by Lind Dna. Beautiful, practical and sustainable, it is made of recycled leather that also makes it super easy to clean. Curve Cut&Serve by Lind Dna. Made of compact ash laminate, this plate is also heat and dishwasher safe! The rounded profile of this cutlery is ideal to add a funny touch to this table setting! Great texture that recalls the shape left by a spoon on a thick yogurt…yummy! And also perfect to inspire those who are not so much into breakfast! A gorgeous mixed finish with mat outside, shiny inside and an amazing minimalist handle! How to make a water glass interesting? An oblique cut on the top seems a great way to me! The bamboo cap is the ideal complement to the simple anthracite body of this bowl, for a great minimalist-style piece! 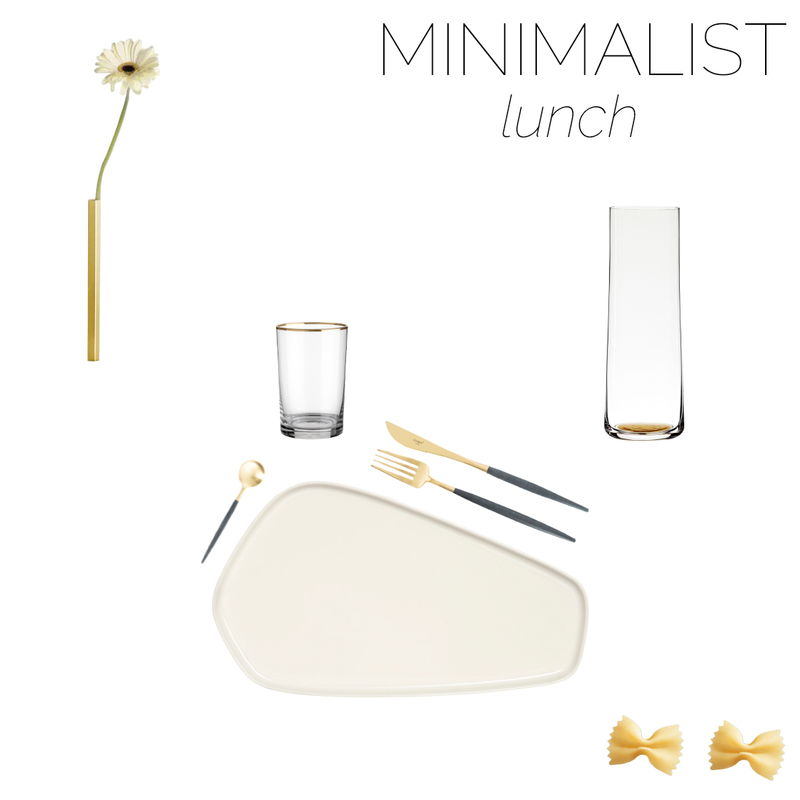 A funny lunch table setting, just to prove that minimalist does not mean serious or dull! Clear colour palette and just a few little gold accents that are so in style at the moment! 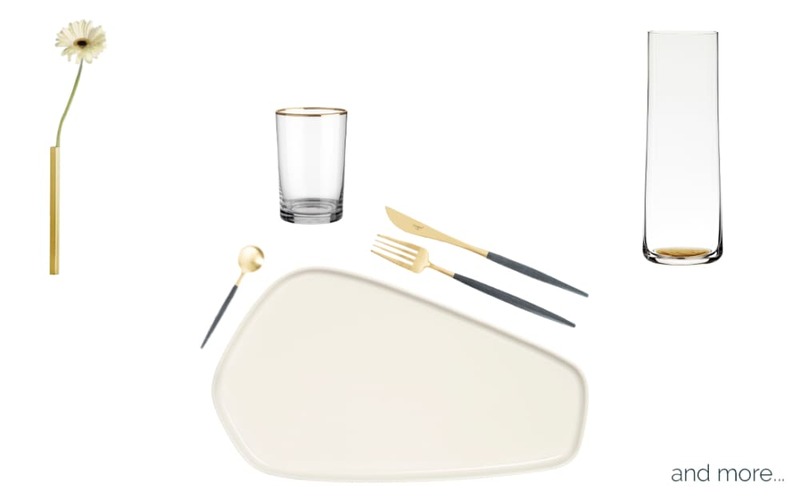 Credit: Iittala,Cutipol (via Amara),H&M Home,Hay (via Made in Design),Peleg Design. Mood board: DforDesign. 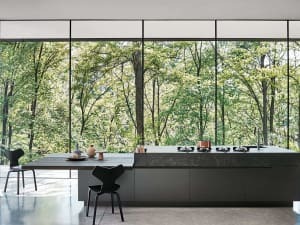 X Issey Miyake by Iittala. An unexpected geometric shape with rounded angles, that make it immediately more laid-back. Glass tumbler by H&M Home. This glass has the simplest shape and finish, but that thin gold detail makes all the difference between minimalist-dull and minimalist-yummy! Same as the glass. The simplest minimalist line, with a tiny detail that makes this the right carafe for this table setting. Magnetic vase by Peleg Design. Now let’s talk about this stem vase! It has a deliciously thin squared shape, a lovely brushed gold finish…but it’s not all! This beauty comes with a thin metal base that allows a little magic to happen. Hide the base below your tablecloth. Put the magnetic vase on top. And voilà, the vase snaps to the base and stays straight and secured! Dinner may be a slightly more formal occasion and this minimalist table setting highlights the carefully chosen details that give it tons of character! 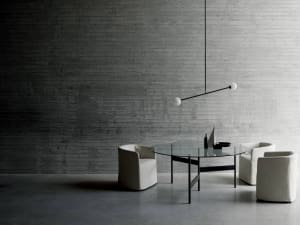 Credit: Serax,Cutipol (via Amara),Eva Solo,Italesse (via Made in Design). Mood board: DforDesign. Never a name was more appropriate! Geometry is exactly what makes this plate special, with its thin border slightly pinched on the ends. Interesting to note, the designer took inspiration from Japanese gardens and origami to come up with this design. And to me, this plate does definitely have something of peaceful Japanese gardens! A mat black finish is what it takes to give character to this table setting. And the minimalist rigour is broken by the wavy shape of the knife. Just the right touch of movement! The oblique edge is a great addition to this glass and makes it modern and crisp, just as we like it! Minimalist yes, but with style! A great wine needs a great decanter and this has very interesting features. It slides perfectly on its base or can sit directly on the table, it has an ergonomic shape that makes it easy to hold, a deep-enough bottom and a handy non-drip spout. Look at it closely, do you also find it seems Pinocchio’s face? Well, I think it was intentional, as this decanter’s name in Vinocchio, which is vino (wine in Italian) + Pinocchio! Genius! So are you ready to give your table setting the attention it deserves? What’s your favourite option? Breakfast, lunch, dinner or a mix? I cannot choose, I love them all! 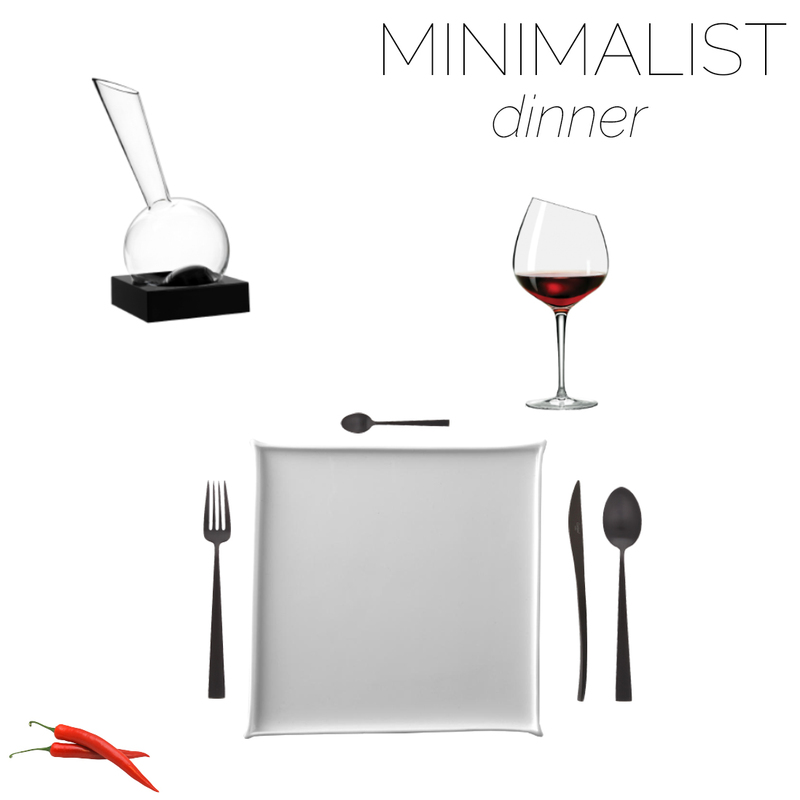 For even more choices, take a look at my favourite minimalist cutlery sets. And if you’re planning a summer entertaining occasion, you don’t want to miss my recent dedicated post on all the things you need for a successful and comfortable entertaining, no matter how small your space is! Don’t forget to follow me on social media to see more of what I’m up to on a daily basis, or just to say hello!